This relatively short walk offers a variety of scenery: the wooded valley following Dean Brook, sheep pasture around Higher Deer House, a Golf Course, and views of Stonyhurst College. The walk is not all on the flat and there are one or two short steep climbs in the Dean Brook valley. Off road parking can be found off the main street at the Village Hall next to the Bayley Arms. 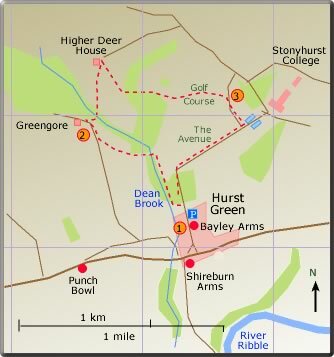 Hurst Green has two hostelries; The Bayley Arms, and the Shireburn Arms Hotel.